If you are born again, the gift of the Spirit — the Baptism of the Holy Spirit — is a gift from our Heavenly Father that belongs to every believer. The gift has been paid for. The gift has already been provided. You do not need to work for this gift or wait for this gift one moment longer. Simply receive this precious gift from our Heavenly Father by FAITH. This is why Paul writes in Galatians to the church at Galatia, “Did you receive the Spirit by the works of the law or by the hearing of faith?” (Gal. 3:2). As with any other precious gift from God (under the New Covenant), we receive by FAITH. We receive by the hearing of FAITH. You will only have faith for the parts of God’s Word that you hear about. This is why in Romans Paul tells us that faith comes by hearing and hearing by God’s Word (Rom. 9:17)! When someone hears about salvation and the good news of the Gospel, faith rises in their heart to be saved. When someone hears about healing and the promises of God that He wants us to be well, faith rises in their heart for healing. And likewise when someone hears about the Baptism of the Holy Spirit and how it is a precious gift that belongs to every believer, faith rises in their heart to receive this precious gift. Sometimes believers struggle to receive the Baptism of the Holy Spirit, because they think they must do something or that they must somehow earn it. Friends, the price has already been paid. Jesus paid the price on the cross! And the gift has already been provided. Our Heavenly Father made this gift available to the church beginning on the day of Pentecost! You did not need to wait! You do not need to tarry! You must simply receive — by FAITH — what God has already provided. This is why Paul tells us, “Having begun in the Spirit, are you now being made perfect by the flesh?” You cannot receive the Spirit by the arm of the flesh—by begging, pleading, or putting yourself through personal anguish and difficulty to earn something that has already been freely given to you. Paul continues in Galatians, “Therefore He who supplies the Spirit to you and works miracles among you, does He do it by works of the law, or by the hearing of faith?” (Gal. 3:5). The answer is clear—of course God does it by the hearing of faith! Paul then gives us the example of Abraham, who simply believed God. Abraham received every good thing from God by FAITH! As fellow believers, as his children under the New Covenant, we must do the same. How was Abraham justified? By FAITH! How was Abraham blessed? By FAITH! How do we come into right standing with God? By FAITH! How do we receive from God? By FAITH! Abraham simply believed God. We must do the same! Today, rest knowing Jesus has already paid the price! Rest knowing our Heavenly Father has already made this precious gift, this baptism of fire, available to you! Simply reach out and pray by FAITH asking to receive the precious gift of the Holy Spirit from our Heavenly Father. He will hear you! He will answer you! And your life will never be the same! 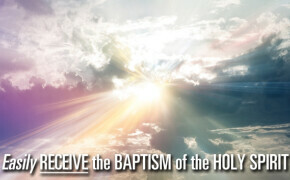 To read more about the Baptism of the Holy Spirit and for helpful resources, visit this page.